Nutgrass Cyperus rotundus and ciesculentus are perennial sedges introduced from Eurasia. It spreads by seed, nutlets and creeping tendrils. Likes wet soil and is hard to control. 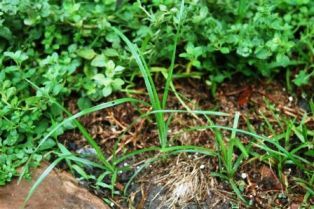 Control in turf by planting ryegrass in the fall. There are some other treatments that work well. There is only one guaranteed, foolproof method to completely kill nutgrass. First, dig out every tiny piece of the plant including the seeds and nutlets. Make sure you get it all by sifting the soil through a mesh such as a window screen. Dump the collected material on the driveway and burn it. Sweep up all the ashes and seal in a concrete box. Drive to the coast and dump the sealed box 20 miles off shore. There are other controls, but none that work completely every time. Sorry, there's no perfect organic or toxic chemical solution yet. The commonly recommended chemicals are Image and Manage. Most everyone in the landscape industry agrees with me that Image doesn't work well. Manage works better (although not completely), but will severely damage, deform or even kill your trees and other plants. Manage is one of the damaging SU herbicides I have warned you about. 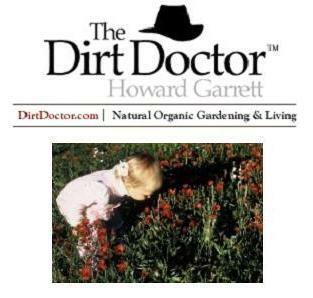 Dr. Carl Whitcomb has researched and written about this for years. All you can do for now is let the problem areas dry out between watering, dig the plants out physically and spot spray with vinegar herbicides, fatty acid herbicides, Avenger or heavy applications of molasses. The United States Department of Agriculture (USDA) is currently experimenting with the use of mustard meal. I have had luck, and others have reported success, killing nutgrass with kindness. Mow, clip or pull as often as you can and apply a heavier than normal application of dry molasses. Use about 3 – 5 lbs. per 100 sq. ft. and repeat in two weeks. Use lesser rates in turf to avoid damage to grasses. The mixed products that contain molasses, cornmeal and wheat bran will also help. The idea here is to stimulate a furious level of biological activity aimed at rotting the crowns of the undesired plants. Pouring liquid molasses or piling dry molasses on each nutgrass plant works if you have the patience. Another method is to remove the weed physically with mechanical devices. 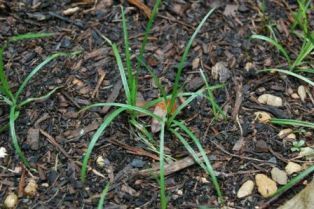 Nutgrass in beds can be covered with newspaper and mulch. Spot spray plants that continue to grow with the vinegar herbicide formula. For turf, overseed problem areas with ryegrass in the fall. Applying corn gluten meal in the spring at 20 lbs. per 1,000 sq. ft. prior to seed germination is also helpful. 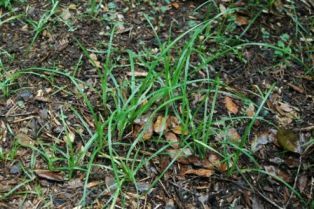 An important point to remember is that nutgrass grows primarily in wet, anaerobic soil. Try applying hydrogen peroxide, the kind at the drug store, full strength to the problem areas. In vegetable gardens and flower beds, except for areas where you have bulbing plants like onion, garlic or saffron, let the weed grow. It doesn’t hurt the plants or the fruit and flower production at all, in fact, just the opposite. It will however grow right through bulbs and corms. If you have some other recommendation that is non-toxic and works, let me know so it can be passed on to the world.